>MEWS FLASH ~ Maggie’s Workshops!! This is very exciting – We just learned that our cost to host Maggie Jackson has been reduced & we are passing the savings on to you. The event fees have been reduced as follows: the Fashion Show is $10, if you plan on attending only the Breakfast Reception & Fashion Show. If you are attending either of the workshops, the Fashion Show is free! The workshop fee for 3 K Club Members is only $75 (includes meal & materials). The fee for non- 3 K Club Members is $90 (includes meal & materials). 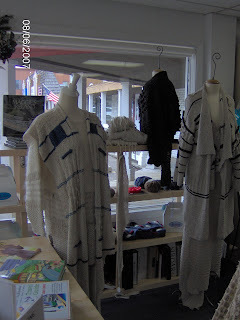 Currently on display in the shop through August 14th, are garments from “Maggie’s Ireland”. This beautiful book is also a 3 K Book Club feature this month (purchase this book during the month of August and receive 10% off yarns purchased for projects for the life of the book!). Maggie has also shipped samples of projects that feature the techniques she will be teaching at the workshops. Watch this blog for the arrival (guessing about 8/13).